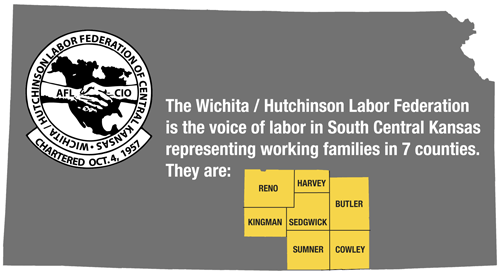 The Wichita / Hutchinson Labor Federation of South Central Kansas (WHLF) is a non-profit labor membership organization devoted to supporting, advancing and advocating for the working people of the south central Kansas region. The WHLF brings together 30 local unions from every trade, occupation, public and private sector of the Kansas economy. We represent over 30,000 union members and their families, including teachers, aerospace professionals, operating engineers, construction workers, electricians, firefighters, state employees, janitors, train operators, and many more who are the face of today's workforce. Our mission is to improve the lives of workers, their families, and our communities, and to bring economic justice to the workplace and social justice to our region. To accomplish this mission the WHLF works to build worker power through political education and action, supporting economic development in South Central Kansas, being an active partner with business and government leaders, organizing workers who choose to be in a union, providing community service and job training, and conducting educational programs for working people.